Moravian motorized filter wheel EFW-2S-10 is to be used with G2 series and it accepts up to 10 36mm filters unmounted. Thanks to special control electronics, the filter wheel is connected directly to Moravian G2 CCD camera body, it does not require to be connected to the control PC and it does not need for external power supply. The ability to capture individual exposures through various filters is one of the key features of the cooled CCD cameras, regardless if being used for scientific research or for astronomical photography. This is why the Moravian cameras were designed to include the filter wheel inside the camera head and to integrate filter wheel control into camera control from the beginning. When more than 5 or 6 filters are necessary or the filter wheel has to be used with the camera, the filter wheel is too large to be placed inside the camera head. External filter wheel is then the only option. CCD camera integrate, in the body of the camera itself, the control electronics for filter wheels. 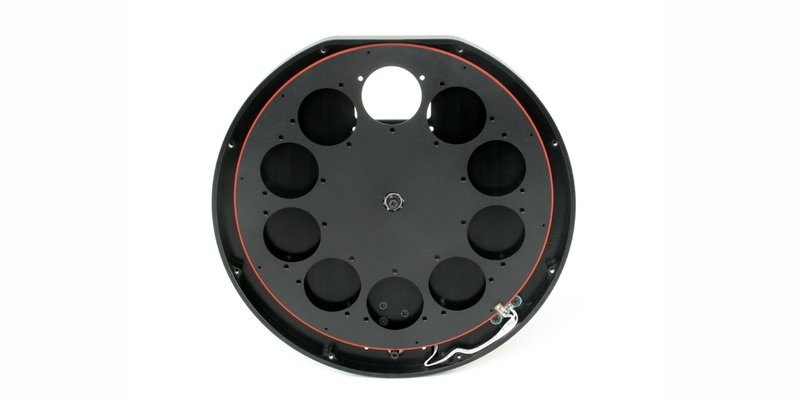 This arrangement makes the filter wheel cheaper and allows you to connect the wheel to the CCD camera with an RJ-45 8 pin cable, sending via this cable also all wheel data which therefore does not require to be connected to the control PC. It also does not even require an external power supply because it is powered directly from the CCD camera. This Moravian motorized filter wheel is to be used with G2 series of CCD camera and it accepts up to 10 36mm filters unmounted.